Aims: The aim was to evaluate the association between oxidative stress with the severity of endometriosis in blood and peritoneal fluid. Settings and Design: This study was a prospective observational study conducted in the department of obstetrics and gynecology in a tertiary center over 2 years in patients with endometriosis requiring laparoscopy. Methodology: Patients diagnosed with endometriosis and undergoing laparoscopy for infertility and/or chronic pelvic pain were included in the study. Out of the 64 patients recruited, only 55 patients formed the part of our study. Blood and peritoneal fluid was evaluated for oxidative stress parameters such as glutathione peroxidase, superoxide dismutase (SOD), and lipid peroxides. Results: The severity of endometriosis was assessed intraoperatively by the revised American Society for Reproductive Medicine scoring in all 55 patients who underwent laparoscopy into minimal (n = 3), mild (n = 7), moderate (n = 32), and severe (n = 17). Median activity of SOD and glutathione peroxidase was lowest in the severe stage of endometriosis, whereas the median activity of lipid peroxide was highest in the severe stage of endometriosis in both blood and peritoneal fluid samples. There was a statistically significant increase in oxidative stress with the severity of endometriosis. Conclusions: Oxidative stress might play a role in the disease process of endometriosis. Control of oxidative stress can be used as the latest treatment option for the management of endometriosis. Endometriosis is one of the most common benign problems encountered in gynecology. Our understanding of endometriosis still remains incomplete and controversy continues regarding its diagnosis and management. Oxidative stress is one among the many etiologic theories for endometriosis. These biomolecules have generated immense research interest. Oxidative stress is detected when there is an imbalance between the antioxidants and the prooxidants. They have been implicated in over hundred disease conditions. Reactive oxygen species (ROS) or free radicals which cause the oxidative stress may increase growth and adhesions of endometrial cells in the peritoneal cavity, promoting endometriosis and infertility. The current treatment option has three main objectives – to reduce symptoms, to help in conception, and to prevent or delay recurrence for as long as possible. There is a considerable interest for the development of noninvasive techniques for management, treatment, and prognosis of endometriosis. Control of oxidative stress is now the latest treatment option for the management of endometriosis. Although oxidative stress is implicated in a number of diseases, various antioxidants are prescribed at random, with the aim to control oxidative stress. Due to lack of appropriate parameters and methodology, it is difficult to quantify accurately oxidative stress in clinical biochemistry laboratory. There is great demand for the detection of minimal-to-mild endometriosis by noninvasive methods as moderate-to-severe forms of the endometriosis can be identified by clinical examination and/or imaging. A number of biomarkers of oxidative stress have been studied in endometriosis with conflicting results. This study attempted to correlate and understand the relationship between oxidative stress biomarker levels measured in patient and its relation with the severity of endometriosis. This study was a prospective observational study conducted in the department of obstetrics and gynecology in a tertiary center in patients with endometriosis requiring laparoscopy. Approval for the study was obtained from the Institutional Ethical Committee (IEC No. 461/2014). Written informed consent was obtained from all the participants of the study. Patients diagnosed with endometriosis and undergoing laparoscopy for infertility and/or chronic pelvic pain were included in the study. Patients undergoing laparotomy for endometriosis, patients on antioxidants such as Vitamin C and E, and those patients whose peritoneal fluid sample was hemorrhagic were excluded. A detailed history was taken which included sociodemographic factors and reproductive and medical histories. Patients were specifically asked about the symptoms related to endometriosis. Along with preoperative blood investigations, blood sample was sent to biochemistry laboratory for the evaluation of markers of oxidative stress, such as superoxide dismutase, glutathione peroxidase, and lipid peroxide. Patients were evaluated by transvaginal sonography on the 2nd day of menstrual cycle by experienced sonographers. Uterus and ovaries were assessed. Ovaries were looked for cyst and its size and mobility. Endometriomas were diagnosed by a typical sonographic picture of homogeneous hypoechoic mass with fine stippling. Pouch of Douglas (POD) was looked for free fluid and its obliteration. Obliteration was assessed by the absence of sliding sign and finally checked for tenderness during probe pressure. Laparoscopic procedure was performed by trained surgeons under general anesthesia. Consent for the operative procedure was obtained from all the study participants explaining the potential complications and risks associated with the surgery as well as anesthesia. All the laparoscopic procedures were performed in the late proliferative phase of the menstrual cycle. All precautions were taken to avoid bleeding from trocar site to prevent the contamination of the peritoneal fluid in POD with blood. Under vision, peritoneal fluid in the POD was aspirated with a needle. If the fluid was minimal, it was diluted with 5 ml of saline. The peritoneal fluid was transferred into a sterile container and sent for the evaluation of oxidative stress. The endometriosis was staged according to the revised American Society for Reproductive Medicine (rASRM, 1997) classification intraoperatively [Figure 1]. All the patients were discharged on the 2nd postoperative day. None of the patients in the study group had any intraoperative or postoperative complications. Venous blood was withdrawn into a sterile plain vacutainer and sent to biochemistry laboratory. The collected sample was immediately centrifuged for 5 min and clear serum was stored at −60° C in Eppendorf tubes. Peritoneal fluid was immediately centrifuged for 5 min. Cellular components were removed and supernatant was stored at −60°C in Eppendorf tubes. 50 μL of serum/peritoneal fluid was added with 550 μL of phosphate buffer with ethylenediaminetetraacetic acid, 50 μL of sodium azide, and 100 μL of glutathione reductase. It was incubated at 37°C for 10 min. Then, 100 μL of nicotinamide adenine dinucleotide phosphate was added to the mixture. Reaction was observed by adding 100 μL of H2O2. Optical density was read at 340 nm at 1-min interval for 5 min. The activity of glutathione peroxidase was hence derived. 0.2 ml of serum/peritoneal fluid was treated with ethanol-chloroform (5:3) mixture and vigorously vortex mixed for 1 min. Samples which were treated were centrifuged at 18,000 g for 60 min, and the supernatant was used for the assay. 0.1 ml of the supernatant was used, and the absorbance was read at 560 nm. The values were expressed in ng/ml. Malondialdehyde (MDA) was estimated by the well-known thiobarbituric acid (TBA) method where MDA reacts with TBA to form a colored complex, which has the maximum absorbance at 532 nm. In a test tube, 0.5 ml of serum/peritoneal fluid was taken and 3 ml of 10% TCA was added to it. The tube was left to stand at room temperature and then centrifuged for 15 min at 5000 rpm. To the supernatant fluid, 1.5 ml of 0.67% TBA was added, mixed well and kept in boiling water for 10 min, and then cooled under tap water. A pale pink color developed, and its intensity was measured at 530 nm. The concentration of lipid peroxidation products was calculated as MDA equivalence. SPSS for Windows version 15 (SPSS Inc., Chicago, IL, USA) was used for statistical analysis. Age and body mass index (BMI) were compared using one-way analysis of variance. The demographic variables were compared using Kruskal–Wallis test. The values of oxidative stress parameters in blood and peritoneal fluid did not follow the Gaussian distribution; hence, data were analyzed by nonparametric test – Kruskal–Wallis test. Results of these analyses were reported using median. P < 0.05 was accepted as a significant level. Sixty-four samples of both blood and peritoneal fluid were collected, but nine samples were not processed as peritoneal fluid of these patients was hemorrhagic. Hence, 55 patients formed part of the present study. All patients with endometriosis were staged intraoperatively. 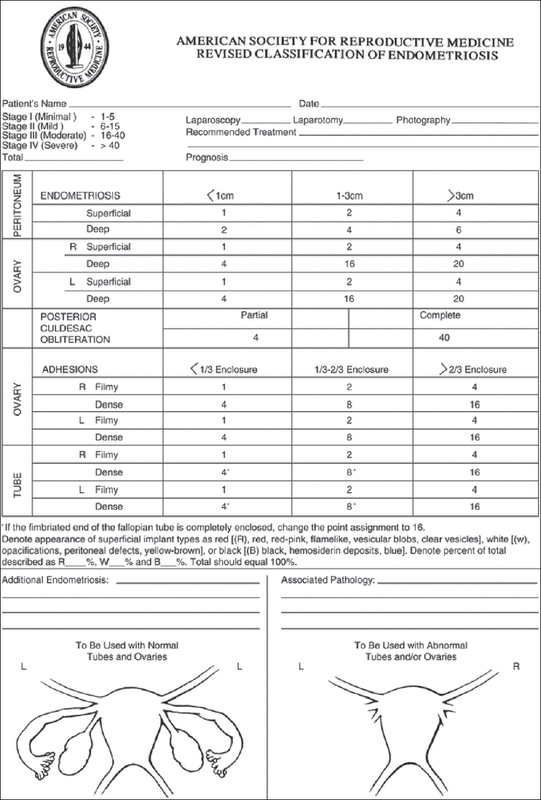 The severity of endometriosis was assessed intraoperatively by rASRM scoring in all the 55 patients who underwent laparoscopy as shown in [Table 1]. Baseline demographic and clinical characteristics are shown in [Table 2]. Age and BMI of all the patients in the various stages of endometriosis were comparable. Forty-four (80%) patients had primary infertility. Eleven patients (20%) had secondary infertility. Maximum patients had unilateral endometriotic lesions, whereas only 12 patients had bilateral endometriotic lesions. Twenty-four patients had endometriotic lesion sized less than 3 cm, whereas 31 patients had endometriotic lesion sized more than 3 cm. Dysmenorrhea was the most common symptom present in 63% of the study population [Table 3]. Chronic pelvic pain was the next common symptom, found in 27% of the patients with endometriosis. Dyspareunia as a symptom was present in only 18% of the patients. Disorders of menstruation were not very common. The peritoneal fluid of all the 55 patients with endometriosis showed oxidative stress. Levels of oxidative stress markers were analyzed and compared between each stage of endometriosis (mild to severe). It was observed that as endometriosis became more severe, oxidative stress increased [Table 4]. There was a decrease of the antioxidant enzyme glutathione peroxidase in both blood and peritoneal fluid. There was a statistically significant difference between its levels in each stage of endometriosis. Superoxide dismutase level lowered with the severity of endometriosis in both blood and peritoneal fluid but was not found statistically significant. There was an increase in the pro-oxidant enzyme lipid peroxide with the severity of endometriosis which was the highest in severe stage of endometriosis and was found to be statistically significant. It was found that 35 patients who had dysmenorrhea as their symptom had less antioxidants (glutathione peroxidase and superoxide dismutase) in both blood and peritoneal fluid, which was found to be statistically significant (P < 0.05). There was a significant correlation between glutathione peroxidase and dysmenorrhea. Lipid peroxide levels were higher in the patients with dysmenorrhea but not statistically significant. Oxidative stress was slightly aggravated in patients with dysmenorrhea. There were 15 patients with pelvic pain of >6 months' duration who were grouped as those with chronic pelvic pain. There were 45 patients with endometriosis who did not have chronic pelvic pain. Patients with chronic pelvic pain had less antioxidants in the blood and peritoneal fluid but not significant. Patients with chronic pelvic pain had higher concentration of lipid peroxide in peritoneal fluid but not in blood. There was no significant correlation between the levels of oxidative stress markers and chronic pelvic pain. There were 10 patients out of the 55 patients who had complaints of dyspareunia. There was no significant correlation between oxidative stress markers in the peritoneal fluid and blood of these patients and dyspareunia. Oxidative stress as a cause of dyspareunia could not be proved. Our study had 43 patients with unilateral endometriotic lesions and 12 patients with bilateral endometriotic lesions. There was no significant difference in the oxidative stress parameters and laterality of lesion. While 24 patients had lesion size less than 3 cm, 31 patients had lesion size more than 3 cm. Except for the level of lipid peroxide in peritoneal fluid, other markers of oxidative stress had no significant correlation with the size of endometriotic lesions. Endometriosis is an elusive disease with an obscure pathogenesis. Despite substantial advances in our understanding of the pathogenesis of endometriosis, yet there is no reliable noninvasive alternative to laparoscopy for the diagnosis of the disease. The objective of this study was to evaluate the complex role of oxidative stress in peritoneal fluid and blood in the etiopathogenesis and severity of endometriosis. Studies have suggested that a key inflammatory environment associated with endometriosis is found in peritoneal fluid. Oxidative stress takes place in macrophages and other inflammatory cells of the peritoneal fluid, with cellular debris serving as a substrate. The products derived from this process move to the systemic circulation in serum/plasma. That is why peritoneal fluid might be more vulnerable than serum to the effects of oxidative stress. Moreover, oxidative stress biomarkers in serum may reflect oxidative status which is due to other causes, in addition to endometriosis, whereas in peritoneal fluid, as it is localized, it may give a more accurate result of endometriosis. Many studies have shown that women with endometriosis have increased peritoneal fluid volumes and number of peritoneal macrophages. Oxidative stress has been studied in normal ovarian cycle by quantifying various markers., Oxidative stress occurs when the level of ROS is more than the scavenging capacity of the antioxidants. On the other hand, several studies have found no relationship between peritoneal free radical activity or antioxidant levels and endometriosis. Many substances which are active (oxidative stress parameters, cytokines, growth factors, and hormones) in endometriosis patients at different stages of the disease have been identified. Furthermore, these mediators can represent a nonsurgical method for diagnosing endometriosis. Our study was a prospective study consisting of 55 women diagnosed with endometriosis who were managed surgically by laparoscopy. Age and BMI of all the patients were comparable. As shown in the results [Table 1], most of our patients had moderate-to-severe endometriosis. More than 80% of them had presented with infertility as their complaint. Endometriosis can be asymptomatic in 10% of the cases. In our study, 80% had presented with primary infertility as the only complaint and the rest had multiple symptoms. The symptomatology of the patients did not correlate with the severity of the disease. Our study showed lower levels of glutathione peroxidase in severe endometriosis. This result was similar to another study by Szczepańska et al. They also found that there was statistically significant difference in glutathione peroxidase levels in between the study groups. It was found lowest in the endometriosis group. In contrast, Polak et al. found no difference in the levels of glutathione peroxidase in between the different stages of endometriosis. In the present study, superoxide dismutase level was found to be lower in peritoneal fluid and was lowest in the severe stage of endometriosis. Our result was similar to that of other studies by Liu et al., Szczepańska et al., Prieto et al., and Jaiswar et al. They all found that superoxide dismutase was low in patients with endometriosis. However, they did not compare its level with the severity of endometriosis. Lipid peroxide level increased with the severity of endometriosis in our patients with endometriosis. It was highest in the severe stage of endometriosis, and there was a significant correlation between the level of lipid peroxide and severity of endometriosis in both blood and peritoneal fluid. Our findings were similar to other studies by Szczepańska et al., where they found that patients with endometriosis had higher level of lipid peroxide. Jaiswar et al. and Murphy et al. in their study also found higher level of MDA in patients with endometriosis. In contrast to our study, Arumugam et al. and do Amaral et al. found no significant difference between the levels of lipid peroxide and severity of endometriosis. They also measured lipid peroxide levels in different stages of endometriosis. Although lipid peroxide levels were higher in severe endometriosis, there was no significant difference. Among the many published studies, the control groups, methodology used, and the severity of endometriosis were very different. All these factors make it difficult for us to compare our results with those obtained in previous studies. A possible explanation for this discrepancy in results is that oxidative stress may occur only locally, such as at the site of bleeding, and may change with the day of menstrual cycle when it was collected. It is not increased in the whole concentration of peritoneal fluid. Only few persistent markers of oxidative stress should be measured. Markers which are stable such as enzymes or stable by-products of oxidative stress can be detected at any time and are constant. Further studies are needed for clarification. In the present study, 35 patients had severe dysmenorrhea as their complaints. We found a lower level of antioxidants in both blood and peritoneal fluid of these patients. Patients with dysmenorrhea had aggravated oxidative stress than those without. Results of this study were consistent with those of a study by Turhan et al. Their study had 58 women, of which 33 comprised the study group with primary dysmenorrhea and the control group comprised 25 healthy women. Plasma levels of MDA were higher in patients with primary dysmenorrhea compared to those in the control group. As superoxide dismutase levels, which is a specific antioxidant marker, were unchanged between the two groups, in their study, it supported the opinion that increased oxidative stress in dysmenorrhea depended only on the excess of free oxygen radicals. In the present study, ten patients had dyspareunia as their complaint. There was no statistical difference when oxidative stress was compared among patients with and without dyspareunia. In our study, we found that there were 43 patients with unilateral lesions and 12 patients with bilateral lesions. There was no significant oxidative stress in between unilateral and bilateral endometriotic lesions. In the present study, there were 24 patients who had lesion size less than 3 cm and 31 patients with lesion size more than 3 cm. Oxidative stress among both the groups was compared and found to be insignificant. No other study has correlated oxidative stress with size and laterality of lesion. Understanding the mechanism of ROS, oxidative stress, cytokines, and growth factor, their production and detoxification in a better way, further investigation of their effects on the peritoneal fluid environment will help us to acquire new insight in this disease. This may lead to the development of novel diagnostic and therapeutic remedies. Dietary supplementation with antioxidants will be a better potential strategy for long-term management of endometriosis, as it is cost-effective, noninvasive, and there is no fear of toxicity. Currently, biomarker research in endometriosis is lacking reproducible data with high sensitivity and specificity. In addition, limitations derive from small sample size and suboptimal characterization of specimens (no breakdown according to menstrual phase or lesion phenotype). Of the several factors that contribute to the lack of understanding of endometriosis, perhaps, the most significant is the delay in the diagnosis of endometriosis by 8–11 years before its diagnosis. The greatest need is for noninvasive detection of endometriosis, especially minimal-to-mild endometriosis as it is difficult to detect it, whereas moderate-to-severe forms of the disease can be identified by clinical examination and/or imaging. Despite the plethora of studies on endometriosis biomarkers, neither a single biomarker nor a panel of biomarkers has been validated for a noninvasive diagnostic test with sufficient sensitivity and specificity. The oxidative stress status represents a mechanism which is amenable to treatment or prevention of endometriosis. These novel avenues may help to reduce the health-related morbidity and health-care costs of endometriosis. The results of this study demonstrate that oxidative stress is present in all patients with endometriosis. Oxidative stress is found to increase with increase in the severity of the disease. Discovery of new biomarkers for oxidative stress and validation of putative biomarkers are crucial to make progress in the field. Identification of biomarkers for early noninvasive diagnosis of endometriosis should be identified as a priority. It may also be used to follow the disease progression and for early clinical application. Hence, antioxidants can be considered as a good treatment option in patients with endometriosis to prevent oxidative stress and in turn prevent the progression of disease process. We would like to thank Dr. Asha Kamath, Associate Professor, Department of Community Medicine, Kasturba Medical College, Manipal University, Manipal, for the statistics. Bedaiwy MA, Falcone T, Sharma RK, Goldberg JM, Attaran M, Nelson DR, et al. Prediction of endometriosis with serum and peritoneal fluid markers: A prospective controlled trial. Hum Reprod 2002;17:426-31. Sharpe-Timms KL, Young SL. Understanding endometriosis is the key to successful therapeutic management. Fertil Steril 2004;81:1201-3. Van Langendonckt A, Donnez J, Defrère S, Dunselman GA, Groothuis PG. Antiangiogenic and vascular-disrupting agents in endometriosis: Pitfalls and promises. Mol Hum Reprod 2008;14:259-68. Oh HK, Sin JI, Kim JH, Hong SY, Lee TS, Choi YS, et al. Effect of age and stage of endometriosis on ovarian follicular loss during laparoscopic cystectomy for endometrioma. Int J Gynaecol Obstet 2011;114:128-32. Satyam SM, Bairy LK, Pirasanthan R. Influence of grape seed extract and zinc containing multivitamin-mineral nutritional food supplement on lipid profile in normal and diet-induced hypercholesterolemic rats. J Clin Diagn Res 2014;8:HC12-5. Baltacioǧlu E, Akalin FA, Alver A, Balaban F, Unsal M, Karabulut E, et al. Total antioxidant capacity and superoxide dismutase activity levels in serum and gingival crevicular fluid in post-menopausal women with chronic periodontitis. J Clin Periodontol 2006;33:385-92. Jackson LW, Schisterman EF, Dey-Rao R, Browne R, Armstrong D. Oxidative stress and endometriosis. Hum Reprod 2005;20:2014-20. Szczepańska M, Koźlik J, Skrzypczak J, Mikołajczyk M. Oxidative stress may be a piece in the endometriosis puzzle. Fertil Steril 2003;79:1288-93. Polak G, Wertel I, Kozioł-Montewka M, Tarkowski R, Kotarski J. Investigation of glutathione concentrations in peritoneal fluid from women with and without endometriosis. Eur J Obstet Gynecol Reprod Biol 2003;109:206-8. Liu Y, Luo L, Zhao H. Levels of lipid peroxides and superoxide dismutase in peritoneal fluid of patients with endometriosis. J Tongji Med Univ 2001;21:166-7. Prieto L, Quesada JF, Cambero O, Pacheco A, Pellicer A, Codoceo R, et al. Analysis of follicular fluid and serum markers of oxidative stress in women with infertility related to endometriosis. Fertil Steril 2012;98:126-30. Jaiswar SP, Sanchan R, Singh RK Agarwal M. Free radicals in female infertility. J Obstet Gynecol India 2006;56:64-7. Murphy AA, Palinski W, Rankin S, Morales AJ, Parthasarathy S. Macrophage scavenger receptor(s) and oxidatively modified proteins in endometriosis. Fertil Steril 1998;69:1085-91. Arumugam K, Dip YC. Endometriosis and infertility: The role of exogenous lipid peroxides in the peritoneal fluid. Fertil Steril 1995;63:198-9.
do Amaral VF, Bydlowski SP, Peranovich TC, Navarro PA, Subbiah MT, Ferriani RA. Lipid peroxidation in the peritoneal fluid of infertile women with peritoneal endometriosis. Eur J Obstet Gynecol Reprod Biol 2005;119:72-5. Van Langendonckt A, Casanas-Roux F, Donnez J. Oxidative stress and peritoneal endometriosis. Fertil Steril 2002;77:861-70. Turhan N, Celik H, Duvan Cİ, Onaran Y, Aydın M, Armutcu F, et al. Investigation of oxidative balance in patients with dysmenorrhea by multiple serum markers. J Turk Ger Gynecol Assoc 2012;13:233-6. Pejić S, Todorović A, Stojiljković V, Kasapović J, Pajović SB. Antioxidant enzymes and lipid peroxidation in endometrium of patients with polyps, myoma, hyperplasia and adenocarcinoma. Reprod Biol Endocrinol 2009;7:149. Andrade AZ, Rodrigues JK, Dib LA, Romão GS, Ferriani RA, Jordão Junior AA, et al. Serum markers of oxidative stress in infertile women with endometriosis. Rev Bras Ginecol Obstet 2010;32:279-85.